Justine Anderson performs Berio’s Sequenza III. Photo by Rachel Edward. Curated by soprano Justine Anderson, Signs and Symbols explored three little-heard masterpieces inspired by dreams and the unconscious. New music fans over the age of fifty may be surprised to hear Boulez’s half-hour long serialist saga Le marteau sans maître described as “little-heard.” The chamber work was played to death throughout the seventies as Boulez’s compositional aesthetic cemented itself in composition departments the world over. 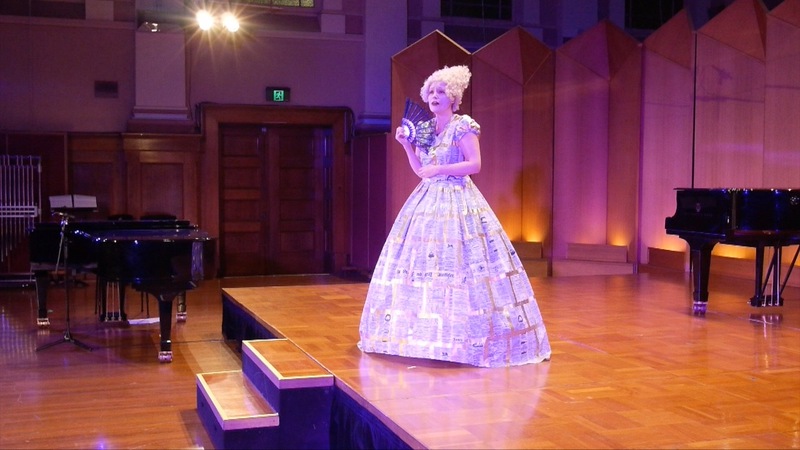 The stunning work almost disappeared from Australian concert programs over the following decades, though its temporary absence may have had some benefits. When audiences hear the work today, they are no longer hearing a work on a pedestal, but a historical document free of the partisan baggage that accompanied its first performances. Without extended-technique pyrotechnics or electroacoustic sorcery, Le marteau sans maître sounds rather dated. And yet, like an Ars Nova puzzle, one immediately appreciates the work’s fine-grained understatement. Conductor Elliott Gyger lost none of the piece’s precise rhythmic counterpoint. Even René Char’s surrealist poetry is treated less with Pierrot Lunaire melodrama than as the machinations of an impossibly complex piece of clockwork. Anderson’s accuracy and control proved equal to the challenge. Some sounds just grab you. As the muted ensemble ticked along, I was drawn again and again to a slithering sound emanating from the back of the hall. It was a maraca. Matthias Schack-Arnott would hold it upside down and make circular movements with his arm, causing the grains inside to shoot around the bulb like cyclists around a velodrome. The resulting ear-massage was part autumn leaves, part rain, part chocolate mousse. When he stopped moving the maraca, the grains would take time to roll to a stop. One seemed to hear each grain rolling over the others until finding its perfect resting place in the percussive microcosm. It turns out that this was not just any maraca, but rather a maraca that the Australian percussionist Barry Quinn used when performing similar repertoire with The Fires of London in the 1970s. Perhaps this was the first ever historically-informed performance of this piece. The audience returned to a drastically rearranged South Melbourne Town Hall for Morton Feldman’s spatialised performance For Franz Kline. The stark, feathered monochrome brush strokes of Kline’s paintings were evoked by the synchronised attacks and indeterminate endings of pitches in the ensemble. Feldman fans may contradict me here, but it was nice to have a Feldmanesque soundwallow after the highly-strung Marteau. Justine Anderson concluded the concert with Luciano Berio’s solo vocal tour de force, Sequenza III. The work requires power, agility, and loads of character. Anderson provided all three in abundance, sweeping through the hall in Barking Spider Visual Theatre’s reconstruction of Mrs Matilda Butters’ fancy-dress constume of 1866, which was printed with the mastheads of dozens of Victorian newspapers. It is good to see the dress in movement after its first new music appearance with The Sound Collectors earlier in the year. It was even better to hear this vocal masterpiece performed with such flair by one of Australia’s finest new music sopranos. Pierre Boulez, Le marteau sans maître; Morton Feldman, For Franz Kline; Luciano Berio, Sequenza III.